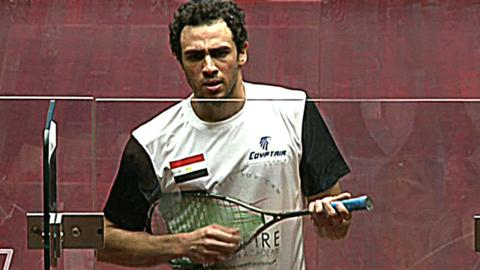 Ramy Ashour - the world's greatest racquet-sport player? When it's put to him that he might be the most talented athlete in the world to hold a racquet, a bashful Ramy Ashour admits "that's pretty great". The 25-year-old Egyptian is more than just the current squash world number one - his elastic, unorthodox brilliance and charisma could be the key to squash breaking out beyond its four walls and regaining a place on the wider sporting stage. Roger Federer, who has been among the tennis players lining up to support squash's Olympic bid, might just have a case when the "most talented" question is asked, while Novak Djokovic, Rafael Nadal, Serena Williams and women's squash number one Nicol David also have the CVs of all-time greats. But Ashour's achievements are impressive and growing, so much so that he is starting to bear comparison to the great Pakistani squash players of the 1980s and 1990s. After injuries disrupted his progress, he won his second world title and regained the world number one spot last year. He arrives at this week's British Open unbeaten in 36 matches stretching back to last year's final. He leads the world rankings with the highest points average ever recorded. And beyond the facts and figures, a quick internet search for video clips illustrates why Ashour is talked about in the same breath as sporting - and not just squash - greats in terms of sheer talent. James Willstrop, from whom Ashour reclaimed the world number one ranking last year, has described it as "a terrible injustice" that the Egyptian "goes relatively unannounced globally". "He is undoubtedly one of the greatest sportsmen on the planet - certainly the most talented holding a racquet in the modern generation," said the Englishman in his book Shot and a Ghost. Willstrop's father, Malcolm, one of the sport's coaching greats, says: "Ramy Ashour is something else - his movement is better than anyone in the game, and allied to his unique racquet skills and vision, he lights up the sport." Despite all this, there have been plenty of close calls during his 12-month unbeaten run and Ashour admits he still feels vulnerable, saying recently, "Maybe I am too emotional." "I'm always thinking there are no guarantees," he tells BBC Sport. "We're all very close and there are many incredible athletes. It's pretty close between all the players and I'll accept losing if it happens. "The winning run does bring pressure and it gets to you mentally, the devil gets to you, and that's the battle." Ashour was captivated by squash from the moment his father took him to watch in the days when greats like Jansher Khan would play in Egypt, with the pyramids providing a spectacular backdrop. "I was six years old and amazed by these glass courts and how close you could get to the sport," he says. "I picked up a lot from great players - everyone used to go and it inspired me. "I never imagined that I could get to be world number one. Of course I respect all the great names, but I never want to be like someone else. I just push myself to my limits." Perhaps because his style suggests it all comes so naturally, Ashour is keen to convey his seriousness about the sport. Would he rather play beautiful squash or winning squash? "Definitely winning squash. I might play a bit differently and a bit unorthodox, and when I get messages from people saying they like the way I play it really inspires me, but I want to play winning squash. "It's never skill before will - I believe in will before skill. I think the game is all about consistency, I always aim for that, I love that we keep learning. "I've always been very committed. I love this sport, but the last two years I've had a lot of injuries and you sink to the bottom. I was forced to be very motivated, disciplined and change everything from nutrition to training." Ashour cites his current eight-week training block in preparation for the British Open as an example of that dedication, and he remains based in Cairo amid the backdrop of a revolution. "I love it here but we have a lot of turmoil and problems," he says. "I have friends, family and a lot of training partners and come back whenever I have the chance. "I have an academy and it's very exciting to be around the kids. I have a big team and they all know my thoughts on squash. If I'm not here we can communicate on Skype. I try to get on court with the kids whenever I can. "Everyone is pretty depressed and not in the best place mentally, because after revolution there are a lot of hard times to get the country back on its feet. People are not that optimistic but we hope for the best. "We're not sure the people (in charge) are doing the best job. People aren't as happy as they used to be. All Egyptians are talking about politics now because of the situation. I think 90% of Egyptians were never talking about politics before, but now they do." With his country in "turmoil", Ashour could be forgiven for not being overly concerned with the less serious matters of sports politics, but far from it. Squash faces a few weeks and months that will define its future, with Ashour and David, the impressive women's number one, the faces of the campaign to get the sport into the 2020 Olympic Games. The International Olympic Committee will cut the current shortlist of eight sports on 29 May, before making a final decision in September, and Ashour will be living every minute of the process. "The Olympics is the most important thing in every squash player's life," he says. "We've been trying to get it where it belongs and we're doing all we can to convey the message and show the IOC the potential of the game. I think playing in a World Open final is great, but the pressure to get squash into the Olympics is history and helping the game survive." For now, Ashour is focused on winning the one major title that has eluded him and so extending an unbeaten run that passed the one-year mark on Monday. England's Nick Matthew beat him in last year's British Open final, but Ashour insists: "It feels good to go back. It's always good to play in front of a knowledgeable crowd and England is the motherland of the sport."